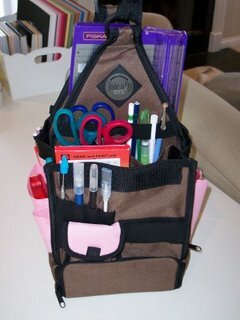 I am in a state of organized bliss right now with my new SMOKIN' Tote-ally Cool tote by AMM! I got it today and it has made my day. Forget that, it made my week!!! I didn't think it would really hold all that much or change my life in any way. Wrong!!! I emptied out 2 or 3 drawers and filled this little goodie up. I am so happy! Now I can have all my essentials at my fingers while I scrap. I even put stuff I always need but don't have nearby. It's so easy to pull things in and out too. That made me love it more. Now I am going to put this on a little stool by my desk and have access to everything. There's even a little drawer that pulls out on the bottom! I'm going to put a plastic case in the middle with small embellishments. I probably have one somewhere in my messy closet! and there's room for more, especially in the middle where my trimmer is! I'm so excited, can ya tell? Just had to share my excitement. 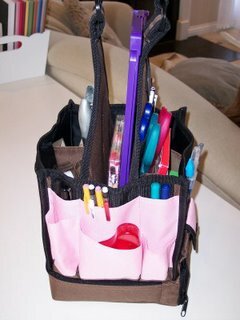 I LOVE to organize! I think I started a trend at Scrap It girl! I'm so glad you love your tote. I told you how much I loved mine when Eric got it for me for Christmas. It's just so easy and organized and such a yummy color. I think I need to work on starting another trend, don't you? LOL! I got mine today too! Although I didn't get home tonight in time to fill it -- that will have to wait until after church tomorrow! However, I LOVE this list -- it will help me prioritize and organize as I put mine together. I am doing the happy dance with you. And Tiffany -- you are WELCOME to start any kind of trend that gets Tracie and me BOTH this excited. You go girl! It was fun to have you visit yesterday. I cannot believe how much stuff you put in there! wow! that is very cool and it's PINK, my fave! I love mine too! I just don't have half taht stuff in there! I better get packin'! Blessings! Ummm, I think you forgot to list the kitchen sink! The bags are super popular at Memories, too. I was on the fence about getting one until I saw yours and what you have in it. How very cute! Man, I can't believe you put all that in there! Love the color also! If I actually could go to crops, I might need one of these! You have a blog??!!?? Why didn't I know this? Glad I found you, and so glad you're gonna make me buy that tote.